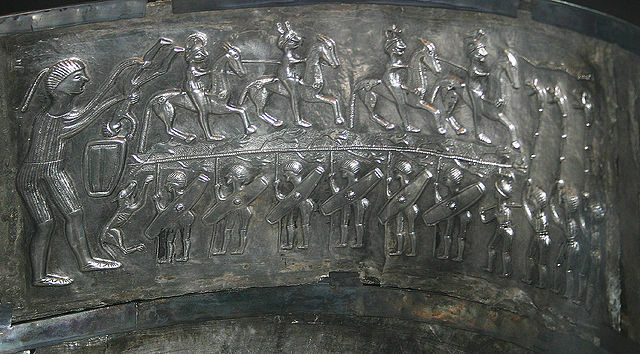 This interior panel from the famous Gundestrup cauldron appears to show a line of seven mail-clad, shield and spear-wielding Celtic warriors advancing in a line from right to left towards a giant warrior who appears to be holding the body of another small warrior over a vessel of some sort. A dog or wolf appears to jump up at his feet. Proceeding from the giant along the upper row, are a line of four finely-arrayed horsemen with elite crested helmets, passing from left to right. Preceding them is a snake. The footsoldiers of the bottom row are followed by three carnyx (boar-headed celtic war-horn) players, whose horns reach up to face the cavalry riding back towards them, and the snake 'flies' above the horn chanters. Separating the rows of footmen and cavlry is a branch from which sprouts foliage or flowers. The metalwork around this is textured, suggesting an aura, a river or a footpath. The 'spears' of the footmen seem to connect with the trunk of the branch. The silver Gundestrup cauldron was probably a ritual deposit in water, pledged to the gods, as it was discovered in pieces in a Danish bog in 1891. Such deposits were an archaeological feature of Europe's 'Atlantic Bronze Age' which were influential upon the Celtic Iron Age cultures of north and central Europe. The organised style of the warriors, their mail suits and war trumpets seem date the cauldron between the 3rdC BCE and the 1stC CE during which time there were broad military and cultural interactions between Celtic tribes of Gaul and those of south and central Europe, explaining the artistic styles (and that of the armour) depicted on the cauldron: In fact, some design elements on the cauldron are so similar to those on objects found in the 'Letnica Hoard' (Bulgaria) to suggest a Gallo-Thracian origin for at least some of the panels. The cauldron shows aspects of both military and spiritual ideas of the afterlife which commentators typically associate with Celtic Iron Age culture. These are 'ordinary' footsoldiers kitted uniformly for war with shields, spears and chainmail vests. There are seven armed men and three carnyx players. The last of the armed men carries no shield, and may be a youth, as he stands below the topmost 'sprout' of the tree-like design above their heads. They are clearly marching into battle, towards the dog/wolf and the giant figure with his cauldron, who appears to be placing one in or pulling one out of the cauldron. The soldiers are marching in the direction of the roots of the aforementioned tree design. Interestingly, it can be seen that their chainmail hauberks finish at the knee, below which they appear to wear hose and rawhide sandals on their feet, similar to those still in use in Ireland and the Isle of Man into the 19thC. Proceeding from the apparent god and his cauldron are four mounted men (knights), remarkable for their elaborate crested helmets. The horses and more beautiful helmets mark them out as part of the warrior elite, and the implication of their appearance in the panel is that valiant footsoldiers might become so great – either through death or attainment. It is notable that there are only four knights, compared to the eight warriors going towards the cauldron (including the man held by the 'god'). Assuming that all of the soldiers on the lower row were looking forward to death in battle, then the panel suggests only four of these seem to have achieved a more glorious reincarnation! This again links to the Norse accounts of beliefs about death of warriors in battle which suggest that only half of the slain went with Odinn to Valhöll. Another interesting concordance. The first is represented by the animals in the image: first of these are the cavalrymen's horses, which would bring the number of sentient beings up to eight in the top row. The other is the ravenous dog or wolf, who like the crows and carrion birds depicted elsewhere on the cauldron would be features of any battlefield. The folklore of hosts of the restless dead remaining in Atlantic Europe after the Iron Age seems to have relevance here: the Sluagh Sidhe of the Gaelic world, and the 'Wild Hunt' of the Germanic world in particular. It may be that the souls of the unglorified were believed to have been incarnated in the form of the animals who haunt battlefields and the margins of human habitation: the corvidae (crows), vultures, wolves, dogs and foxes. By consuming the flesh of the glorious and providing good deeds in the form of omens and warnings, they might find themselves given a better incarnation in the next life, as well as speeding the recovery of the battlefield etc. The second possibility of reincarnation is represented by the tree – the ancient metaphor for human generations: 'root, branch and seed'. The panel's design with the tree apparently growing from it suggests the dead are fertilising the regrowth of future generations, perhaps implying the reincarnation of less worthy footsoldiers as humans, ready for another 'go' at attaining greater glory. My feeling, based on the residual folklore and traditions of Europe, is that the truth probably lies somewhere between these two suggestions. The transmigration of souls (described by Roman authors as a central tenet of Gallic/Celtic faith) might lead to a number of outcomes, based variously upon the achievements of individuals in this life: a glorious afterlife, reincarnation as a human, or even a cavalryman's horse, or as a restless ravening creature who plays an important role in the regeneration processes of nature, and who might offer auguries to the living. 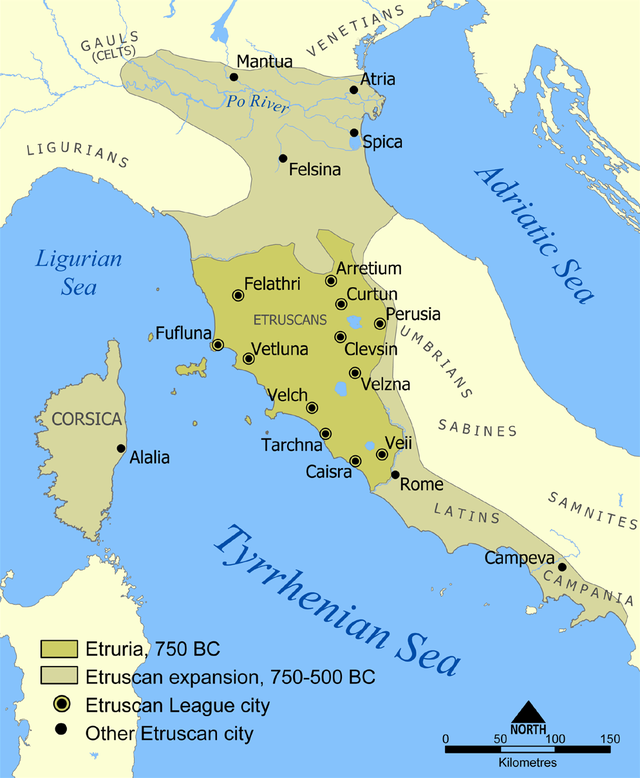 The calls of ravens and crows, the flight-patterns of birds and the calls and shouts of canines and horses, were all recorded as potential sources of augury in ancient Europe until at least the middle ages. The snake has been a symbol of reincarnation for a very long time, based upon their continuous unblinking stare, their shedding their skins, their love of chthonic lairs from which they emerge into daylight, and from their ancient philosophical (morphological) classification along with worms, larvae and maggots as part of natural putrefaction and regenerative processes of nature. 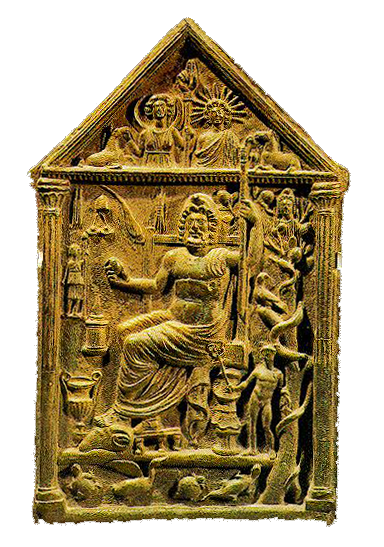 The snake is also notable for the visceral, terrifying/transfixing ability it has over its prey, bringing us here to discuss the Carnyx, above which the snake is positioned in the panel. The was the war-trumpet par-excellence of the Celts, whose terrifying cacophonic honking seemed designed to evoke the enraged squeals and bellows of an attacking boar, stag or bull, augmenting the terrifying transfixing effect of soldiers' war-cries upon an enemy. The horn was apparently a potent weapon in itself, designed – like the gaze of the snake – to sap the morale of the enemy. 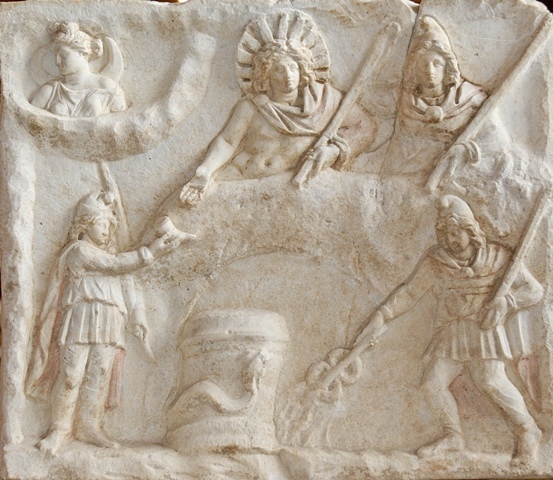 This panel appears to show imagery promising soldiers reincarnation in battle. 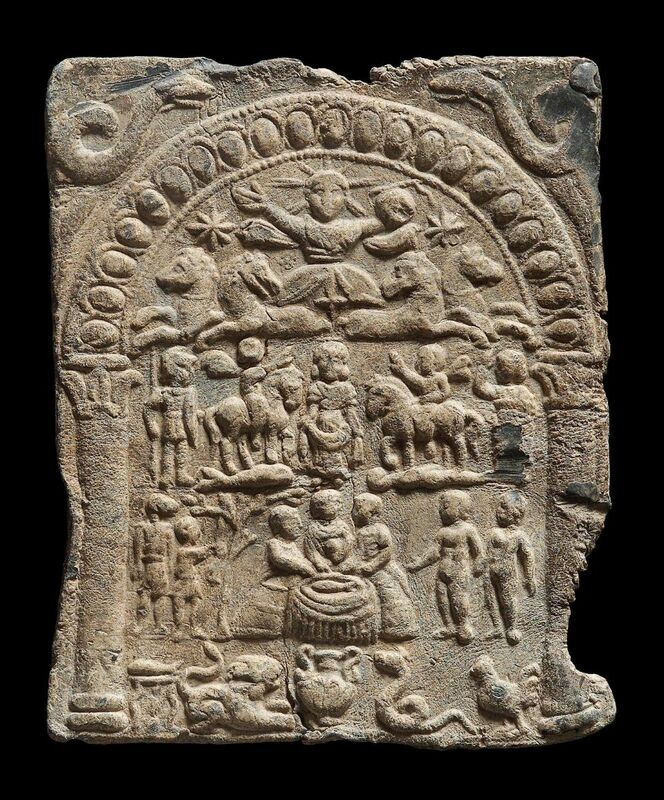 Their deaths are being 'inverted' into a renewed, more glorious life, and the cauldron and tree act as a central metaphor of regrowth from the well of life, with the dog and snake representing the earthly and allegorical forms of this natural process. 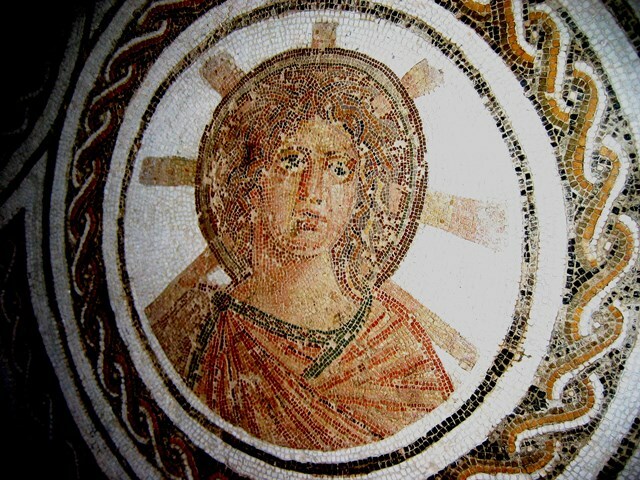 The Evil Eye in ancient Atlantic Europe, ‘101’. The eye is a curious organ. As well as receiving light, it appears at times to emit it also. This can be illustrated by the way that nocturnal predators’ eyes appear to glow (actually from reflected light), but there is another ‘light’ of the eye: that which, curiously, seems to disappear from it at the moment of death. This is the ‘spark’ or ‘twinkle’ of the eye whose intensity and quality we perceive to enhance and alter when we laugh, flirt or are excited to enthusiasm or anger. This phenomenon perhaps explained the theory of vision common to the ancient world – that known as the theory of ‘extromission’. It is evident from this that Plato considered the pupil of the eye a ‘filter’ to remove the Lumen element of light so that the meaning (information) conveyed in the Lux could be made available for the soul to consider! 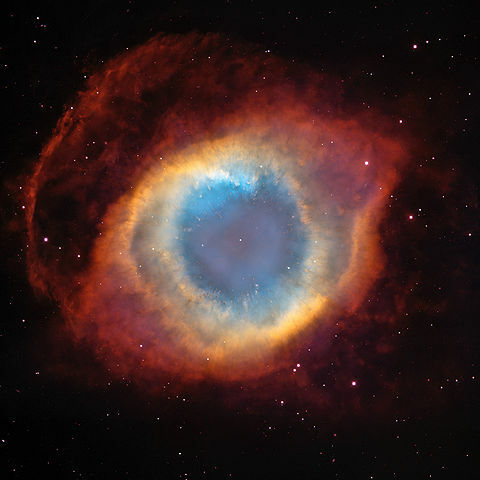 He considered vision and sensation an interaction between emanations of the soul and emanations of the universe. The Greek word for soul, mind, spirit and consciousness is ψυχή – ‘psyche‘. 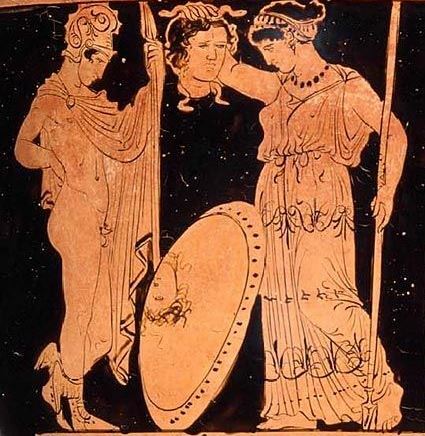 The 5thC BCE playwright-‘philosopher’, Epicharmus of Kos, is quoted as saying “It is the psyche that sees, it is the psyche that hears, all the rest is deaf and blind”. From the 6thC CE, the western Christian church increasingly began to classify for its adherents the ‘sins’ which it believed were the spiritual errors that led its followers away from God: These were “superbia, avaritia, invidia, ira, luxuria, gula & pigritia” – the ‘seven deadly sins’ of pride, avarice, envy, wrath, lust, gluttony, and sloth. Of these, the majority were deemed ‘sins of the flesh’ or ‘material sins’. However, two were ‘sins of the soul’, namely envy and pride. Sins of the Soul were therefore deemed to be those which occupied a spiritual dimension and affected the world in spiritual ways. Envy (Latin: Invidia – ‘in vision’) corresponds exactly to the power known as the Evil Eye. By the ancient extromsission theory of vision the light of the soul illuminated what it perceived as a ‘ray’, and an evil soul would therefore have a negative invidious influence upon what it perceived. Likewise, the common belief that spiritual beings operated in spiritual ways is the foundation for the belief in old Atlantic Europe that ‘fairies’ envied the goods and children of people and wished to spirit them away… The supposed sin of the adversarial Christian spirit called ‘Satan’ or ‘Lucifer’ and his troop of rebel angels was that of pride. The ‘Evil Eye’ belief in the Gaelic provinces of Ireland, Scotland and the Isle of Man remained important until the late 19th century. It evolved (perhaps as a result of widespread ‘witchcraft’ paranoias of the 16th-18th centuries) to engender two forms: The first (and oldest) belief was that it was a passive force derived from latent human foibles of jealousy (innate sinfulness). The more sinister form of the belief was that which believed the ‘Bad Eye’ to be the actual mode of witchcraft by which magical/spiritual harm could be done by a marginal and jealous socially-disempowered person. In Gaelic areas, there are as many records of belief in the possible abduction of vital forces by fairies as there were by supposed ‘witches’ or even by jealous neighbours. This may be a main reason why there were so few reports of judicial or popular murder of people for ‘witchcraft’ or ‘sorcery’: The alleged ‘perpetrators’ were generally not believed prosecutable in court on account of their lack of corporeality, and/or could not be ascribed the criminal concept of mens rea. The Gaelic ‘Evil Eye’ belief manifested to observers between the 16th and 20th centuries as the apparent desire by people to offer a blessing on any thing which they had expressed admiration of. People feared that they might passively or unintentionally cause harm. They also obviously feared that their admiration might invite blame if something went wrong. The fact that people who own something that invites envy are prone to that other ‘spiritual sin’ of pride compounds the social aspects of the belief. Ontologically, the message is ‘pride comes before a fall’, or before a loss. The proud are envied, and the envy is ultimately a force which opposes them. Morally, this suggests that modest-living and modest-speaking is the ideal which invites the least trouble in life… This ideal was to become an important cultural shibboleth of many old Atlantic European subsistence cultures, now fallen victim to certain malign aspects of modernity.